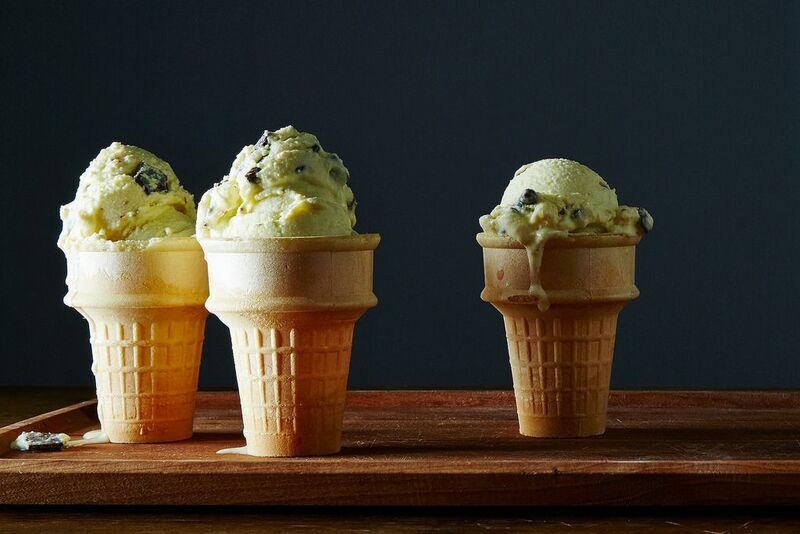 Today: Don't be fooled by its paleness: This mint chip ice cream has bigger mint flavor than any of the bright green store-bought varieties. Please don’t expect the green stuff with gritty bits of chocolate. This stunning, cream colored ice cream, laced with bits or shards of good chocolate, redefines the genre. 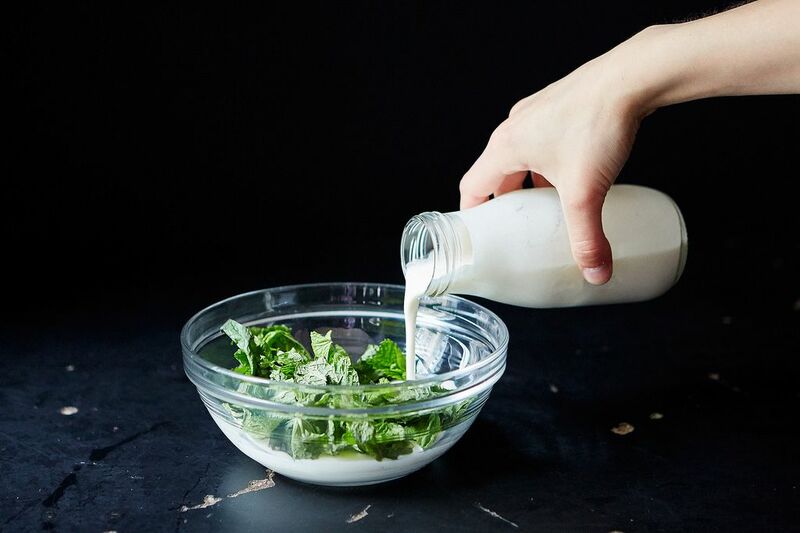 And forget about mint oil, mint extract, or mint flavoring: Infusing fresh mint leaves in cold (rather than hot) cream is the big secret to the fresh mint flavor in this delicate ice cream. The mint leaves are never heated—they are simply left to sit in cold cream for several hours so that the flavor remains bright and clean rather than cooked or vegetal. More: Alice is no stranger to the merits of cold infusion. The same cold infusion method is fantastic for fresh tarragon, lemon verbena, rose petals, and rose geranium leaves, as well as green tea, black tea, or dried lavender (though the amounts will vary). You could also experiment with using half mint and half lemon verbena leaves or trying another combination of any of the herbs or petals mentioned above. Fresh mint ice cream is lovely even without the chocolate—serve it with a fresh peach or nectarine tart or a bowl of strawberries. Can we substitute coconut cream/milk for the heavy whipping cream? Can I substitute spearmint for peppermint? That's what we have in our herb garden. I don't see why that wouldn't work! The flavor might be slightly different, but I bet it would still be nice and refreshing. I have chocolate mint growing in my yard. Would that work for this? I've never actually used it for anything but mistakenly bought some and planted it and now it won't ever go away so I want to find something useful to do with it!